← The Amazing Van Der Heyden in Napa Valley. So I took the plunge and switched to a Mac, no small feat for a PC geek like me. So I had to reinstall the MAC version of my software. Microsoft, no problem they had a form for that, and in minutes i was typing in my Mac Key. In almost every case the PC Key just worked on the MAC. 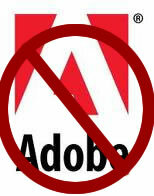 Then I get to Adobe CS5, no form. So I email tech support, I must return my software. So I fill in the forms, then they tell me I cannot get a key i need new disks. I say, but I am using the trial, I just need the key. They say no, a week to 10 days and you have to pay for the CD-ROM, how silly. 1 hour and 5 minutes to find all this out. This entry was posted in Boo Hoo, OMG and tagged adobe, bad service, support. Bookmark the permalink.